Will the stormrider barrel band fit the Diana chaser? It could. you need to pull the barrel off and it can only fit in front of the fore arm. could you give options for mounts to mount a red dot ? the suppressor works very well on the rifle, is it sold separately as a part so it can be added to the pistol (mine does not seem to be removable from the rifle barrel). what's the barrel thread size ? Just get a thread gauge. I had a chaser here for a day and should of checked it then. Ill have to check it when I go over to my buds house. Will this be available in the camouflage version? Has anyone put a red dot scope on this? If so, please share which one works and how you mounted it. Thanks. I put an old Braska on the one I picked up for a friend. Works great. Yes the thread protector is removable. PA does not offer any silencers that will fit it, though I am told a pistol length barrel with a fixed suppressor will likely be offered in the near future. 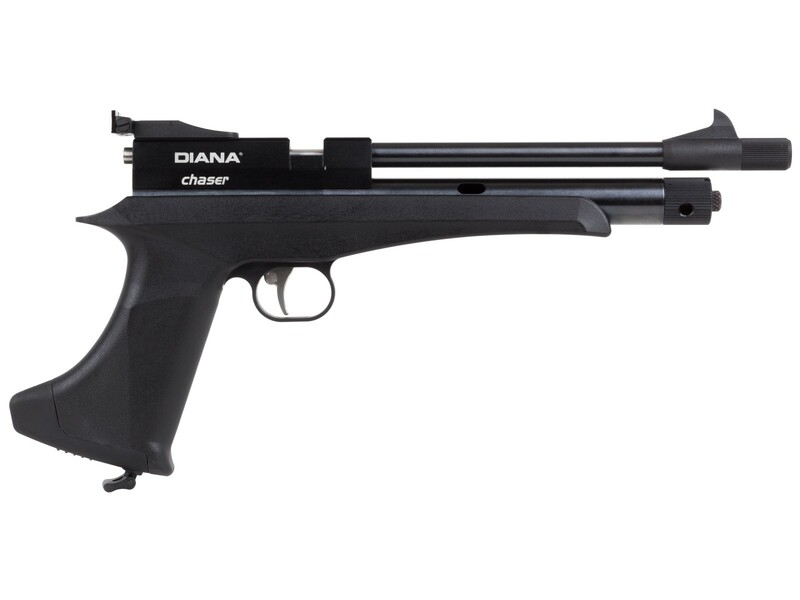 Does Diana sell a silencer just for the pistol? If so, how and where do I purchase the silencer? Is your right eye your dominant eye? If so you should be able to see the sights over the magazine. Try closing your left eye. Has anyone test fired this pistol? Cant find any reviews in any form. Looking forward to be an owner of Diana Chaser. I have fired mine 81 shots, this pistol shoots dead on, lots of power not to loud. For the price this thing rocks!!! Is the front sight removable so a moderator/silencer can be attached? The cap (in front of the sight) is a thread protector. Cannot say for sure yet whether or not that will be removable. Is it possible to post an owners manual on the pa website? If you were to put on the stormchaser mag would you need other parts in order let it function? What is grip diameter? I want my wife to be able to use this. She has a small hand but can handle something like a Ruger MKII or a J frame. Will this be Like the Crosman 2240 in Term's of "After-Market" & "Third-Party" Part's & accessories?.......for example, Would you be able to get a 3rd party "Breech", or Different Barrel Length's, Muzzle-brake's, custom Wooden Stock's, etc,. etc,. ?,,,,as Well as having any "Modding" capabilities?,,,,,,,or Is this a "What You See, What You Get" sort of Deal, where if You want to Change it's appearance,,,,Your Only Option is a "Camo-Dip"???,. Cheer's, & Thank's, Andy. While it's a fair question, there's no way to know at this point. With a relatively new gun, it takes time to build up an aftermarket parts catalog and often times these things are born from the tinkerers and modders that buy them. So at this point, aftermarket parts are going to be slim...but that may very well change quickly depending on the guns popularity. Will this actually be available in June? In .177 how many accurate shots per cylinder. Will it shoot under one inch at ten yards with open sights? Is this only available in left hand as shown. This actually works better for a rt ha d shooter, can work bolt while still gripping pistol . The grip is ambi, the bolt is located on the left hand side of the action. This is much easier for a right handed shooter to operate as you don't need to remove your grip hand from the gun. I am told right hand bolt breeches may be available down the road. What Country are these Manufacturered in? Can it be imported in Canada? Would this knock down a field target at 30 yards? Hard to say, but unlikely at that distance. Is the breech and trigger metal? Is the trigger adjustable?